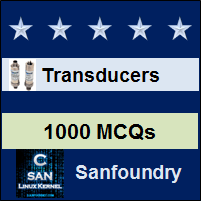 This set of Instrumentation Transducers Multiple Choice Questions & Answers (MCQs) focuses on “Measurement of Current”. 2. What is the purpose of making internal resistance of milli-ammeter very low? Explanation: Low internal resistance will help in easy current flow. If we put a high resistance in series to current flow, it will cause large voltage drop to produce across meter. 3. Which of the following devices can be used with both AC and DC? Explanation: Moving iron type meters can be used in both AC and DC applications. 4. How many electrons are contributed in one coulomb electric charge? Explanation: Charge of one electron is 1.6 × 10-19coulumb, hence one coulomb implies reciprocal of 1.6×10-19 which is 6.25×1018. 5. In a conductor after 1 minute of electron passage, current flown is found to be 1mA. How many electrons would have passed through that conductor? Explanation: For n number of electrons, total charge will be n×1.6×10-19. Then for charge passed in one second will be current flow, here 1mA. 6. Which of the following can be treated as an equivalent of ampere? Explanation: Ampere can be treated as coulomb per second since it is the charge transferred in one second. 7. What will be the average value of current, if its peak value is 43A? Explanation: Average current value is the product of peak value and 0.636. Explanation: By applying a low resistant shunt in permanent magnet moving coil instrument can be converted to Ammeter. Explanation: Current handling capacity of induction meter is high up to 100A. 10. Which of the following effect is used in AC ammeters? Explanation: AC ammeters use electromagnetic principle for operation. This effect is also employed in some integrating instruments.